Things move a little slower around here in the summer. And I’m glad about that. We don’t usually get to take much time to just sit back and do things that are not on our curriculum list. 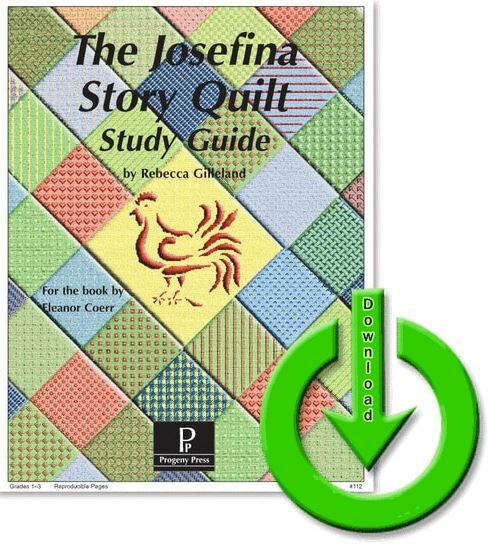 The Josefina Story Quilt Guide by Progeny Press was a fun break from our usual routine. This sweet little book is about a young pioneer girl who is traveling with her family on a journey to California. Faith has a pet hen named Josefina that no longer brings value to the family but her father allows her to keep it, providing it doesn’t make any trouble. But of course it does. Along the many miles on the road to California Faith chronicles her journey on patches for a quilt that will tell the story of their trip. This is a short story but the telling of it leads you through the ups and downs and might even bring a tear to your eye. We read this story along with the Progeny Press e-guide. The e-guide has great questions, activities and crafts along with vocabulary to review that goes along with the story. This is a pdf that will need to be downloaded. We printed off all of our papers and placed them in a binder that we worked through. The e-guide for The Josefina Story quilt is 32 pages long. And full of great ideas that kept us enjoying our time with the book. A few of our favorite activities to work through with the story was making a story quilt of our own. (we pieced ours together with construction paper squares) and making the golden white bread from the beginning of the story. Anytime we do activities like this, the kids forget that we are actually doing school and they eat it up. … Literally. We didn’t make it through all of the questions and the vocabulary the Progeny Press included because our schedule unexpectedly picked up this summer but we covered most of them and spent more time on the Digging Deeper part of the study guide which included verses to look up that went along with the questions. I appreciated this aspect and always do appreciate when we can draw connections to God’s word. You can purchase the e-guide and include it as part of your study on pioneer times or you can use the e-guides suggestions for further readings and make a whole unit study with Pioneers or the Western Expansion. After looking through their site I saw that Progeny Press has several e-guides on books that we will be studying next year, so I plan to grab a few of them as an added bonus to our curriculum. The Review Crew had the opportunity to review several of the Progeny Press e-guides, All of the Progeny Press’s materials are written with a Christian Perspective and are high quality. If you want to read about several of their other e-guides you can click below and hear what they have to say.